Ah summer! A great time of year to enjoy the garden. The perfect time to invite friends over to bask in the sunshine and sit around on a lazy afternoon, drinking cool drinks and watching the world go by. Or, as now, it will be chucking it down with rain. Fortunately there is a part of the garden that works with both these scenarios; the pond. A classic staple of garden design, a pond is a simple, elegant and nature friendly addition to any garden. As a design feature the pond brings water into the design. This may not initially seem too important, but water is simultaneously naturally relaxing and an opportunity for a different kind of planting, adding both tranquillity and variety to a garden. This makes a pond an ideal focal point, something to sit around on a deck or patio with the aforementioned cold drinks to provide a new layer of interest and soothe away the stress of the day.What’s more, once your pond has been built, filling it is easy since the best thing to fill a pond with is rainwater (something that is not in short supply at the moment) letting you take advantage even of the rainy summer days. 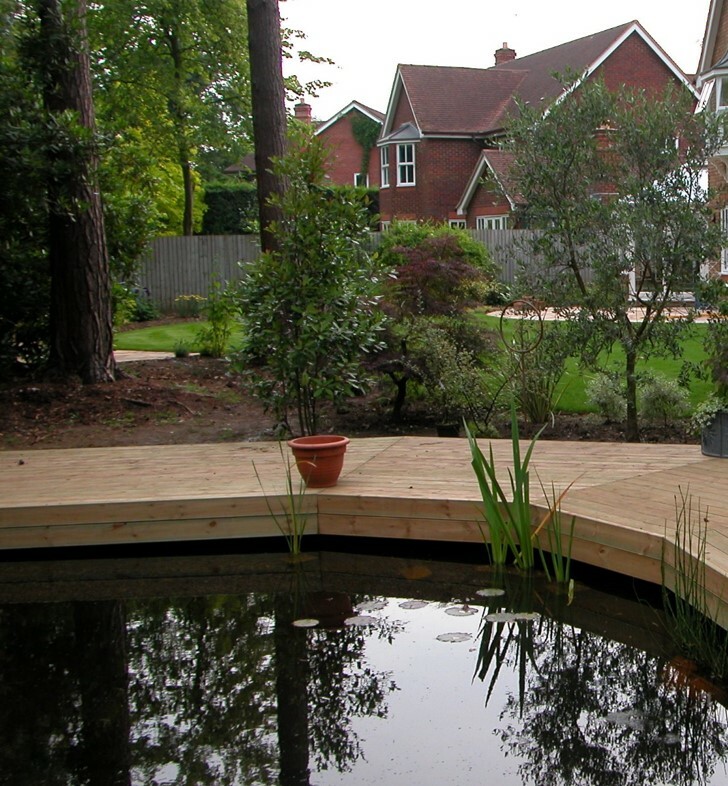 The idea of building a pond is all well and good of course, but it is also a bit of a faff and the addition of decking or paving, as well as the complications of knowing what plants will work with it can seem a bit prohibitive. 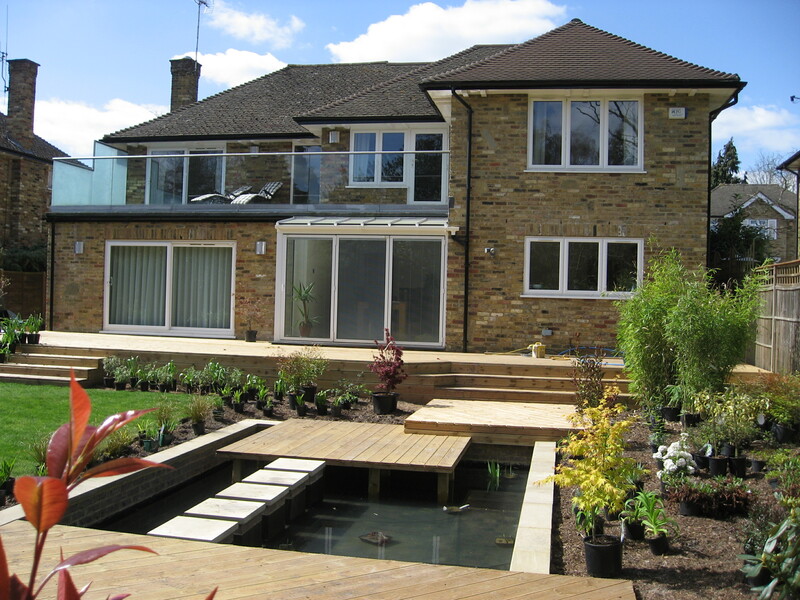 This is why it is often best to get a Garden Designer involved in your aquatic ambitions. Rather than trying to build it piecemeal, leaving you with a huge and purposeless hole in your garden for months on end, a designer can plan the whole thing out right down to the seating area you want around it. 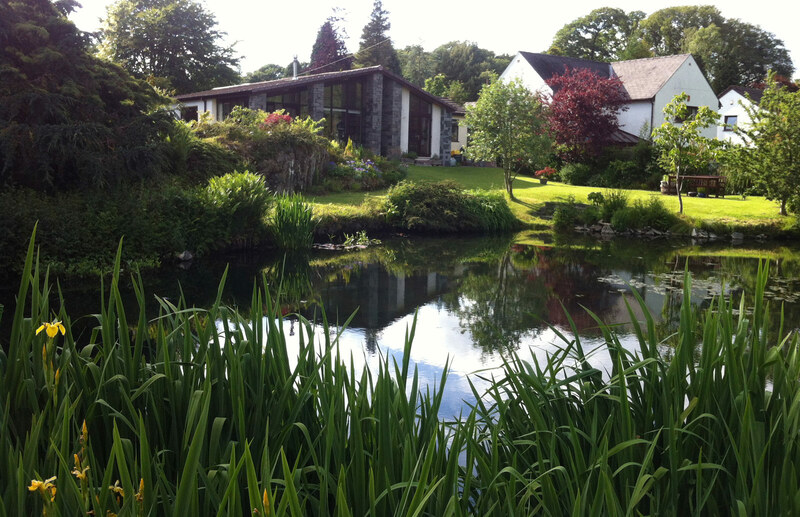 Your Garden Designer will help you decide whether the pond should be a formal or an informal pond. Where it should be located for greatest impact and least maintenance and of course the variety of plants in and around the pond. A well designed pond can add so much interest to the garden. They are addictive and add lighting to the surrounding area, they become quite magical and will add another reason to spend a very pleasant evening by the pond with friends or just yourself, nature and a glass of wine. This pond under construction is formal and has the additional feature of stepping stones from one deck to another. This creates the illusion that the stepping stones are floating on the water. Your Designer can tell you what plants will work based on the depth of the water, giving it all year round interest, build in nifty little features to help you maintain it and can make it friendly to the local wildlife. On that point, wildlife will instantly take up residence, even before your pond is completed. They don’t care whether it is an natural pond or a formal one – water is water and they love it! It is however important to build in a way for small creatures to get out of the pond. This can be a small hidden ramp (in this case down the side of the deck where it is out of sight) or positioned amongst aquatic plants. Don’t worry where it is, they will find it. The size of the pond is not too important as long as it is relative to the size of the garden. Informal natural ponds can basically be any size you want. it follows nature so the eye won’t think it looks odd. A very large formal pond however can look over imposing in a small garden. Again your Designer can help you get the size and shape correct. In this example of a natural garden, the pond is more than fifty per cent of the garden area. The lush planting around the pond and wider garden makes this look spectacular and completely natural. The larger the pond, the greater quantity of wildlife will take up residence. In this case, it is home a large population of moorhens and ducks who enjoy sunning themselves on the lawn and nesting amongst the reeds and flag irises. A pond of this magnitude does require quite a bit of commitment as the maintenance is considerable. It does not have artificial filtration as it would require major equipment. This is not necessary when you have room to filter the water naturally with reeds which is what happens here. Due to the trees around the pond, leaves do have to be netted daily during the autumn. The reward though is quite wonderful. If you like wildlife in the garden, it is another very good reason to get a pond. What with towns and cities expanding and more wildlife being displaced by development, the citizens of the natural world need somewhere to go and garden ponds have become a favourite. 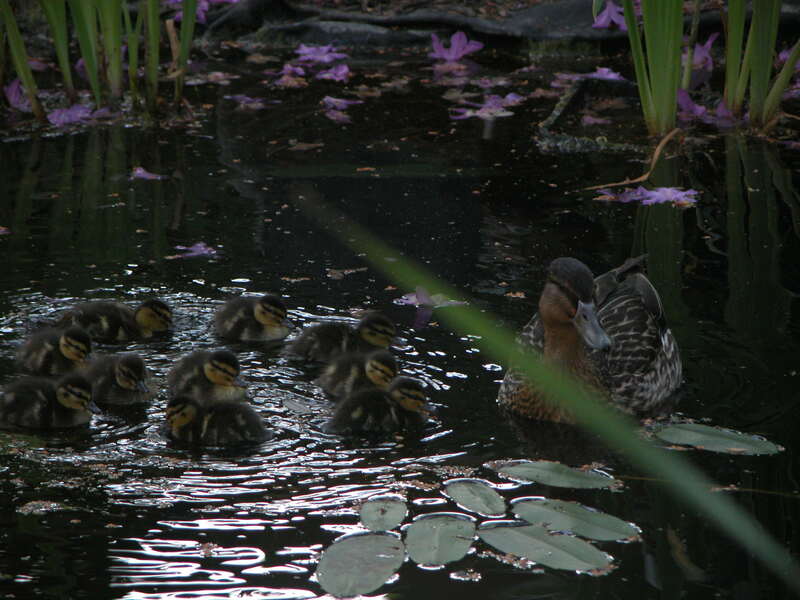 Last year we had a family of ducklings happily quacking on ours and it was wonderful to see them paddling about. It did result in me sleeping on the deck for two weeks to ensure the local fox did not find his dinner there! Hey but that is just me! Of course ducks are something of an extreme example, but these days ponds are not just frequented by those of the avian persuasion but rapidly become a vital habitat for the smaller creatures out there. Everything from frogs and toads to damsel flies and dragon flies all love a good pond. Not only do they provide a lovely home for critters but they are wonderfully interesting features that always have something going on and are a great opportunity for children to learn about nature. Relaxing, vibrant, interesting and educational, a pond is never boring and is a fantastic addition to any garden so add one to your design today.